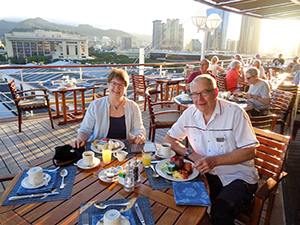 That was a common comment among our friends when we told them we were taking a long, 24-day Pacific cruise on Crystal Serenity from Los Angeles to Sydney, Australia, via Hawaii and several exotic South Pacific islands. Crystal Serenity is a 1,000-passenger ship that consistently rates as among the best in the world. 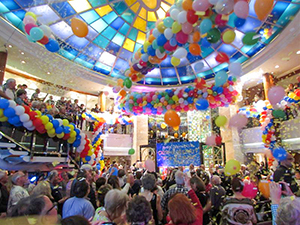 Our trip was the first segment of a 112 day World Cruise with disembarkation in Rome in May. In fact, several guests had a half dozen or more Crystal World Cruises under their belts and were planning to do it again in 2019. 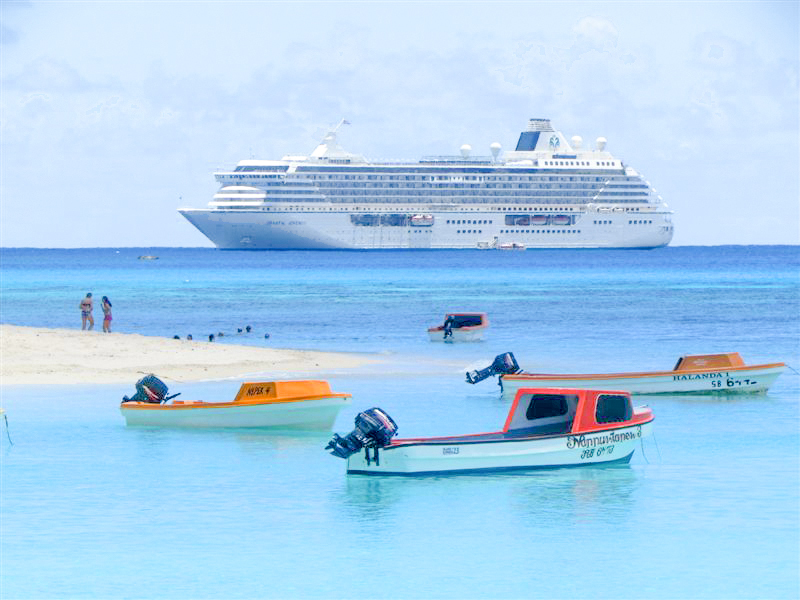 Crystal Serenity is an ideal size for cruising – much smaller than the impersonal mega-ships but large enough to provide a vast variety of dining, entertainment and education options. It’s also all-inclusive with meals, wine, spirits and gratuities included in the fare. Our balcony room was 269 square feet, a bit small for a three-week voyage but well equipped with luxury touches like great lighting, high-def TV with many channel choices, and free Wi-Fi. There was also special cleaning and filters to avoid allergies, a comfortable king bed with top quality sheets and a bathroom that had twin sinks and both a shower and tub (rare on cruise ships). From Day One we were particularly impressed with the quality and attentiveness of the crew. It’s clear that Crystal has chosen and trained its staff very carefully because, almost without exception, they were courteous, friendly and efficient. In the Crystal Plaza (the Atrium) many of them joined us for the balloon filled celebration as Serenity left Los Angeles for its first five-day sail to Hawaii. On some cruise ships, a lot of days at sea can be boring. Not on our Crystal Pacific cruise. We brought books to read (there’s also an excellent library on board) but discovered so many interesting things to do on sea days that several books remained unread. Among the activities were sports (shuffleboard, paddle tennis, golf, swimming, yoga, tai chi and a well equipped gym), bridge, knitting and art classes, choral singing, Yamaha keyboard classes, computer skills (Windows 10; iCloud; Power Point; Moviemaking with iPhone and iPad) plus current films in the Hollywood Theatre and daily team trivia. There’s a non-smoking casino and an elegant daily tea (including Crystal’s signature Mozart Tea). A teak promenade deck encouraged brisk morning walks (three circuits for a mile). 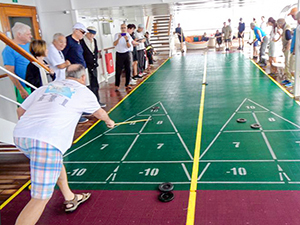 For several years a Crystal tradition has been the World Cruise Games where guests are invited to compete for gold, silver and bronze medals in a variety of activities from chess and Sudoku to shuffleboard and lap swimming. On our cruise, former USA Olympic medalists and world record holders John Naber (swimming), Dwight Stones (high jump) and Wyomia Tyus (100 and 200 meter sprinting) gave lectures about their specialties and presented medals in an elaborate ceremony. The three Olympians were among several other world-class speakers that gave 45 minute illustrated lectures on sea days. We learned about all the ports we were about to visit, the fascinating history of the South Pacific including exploration by James Cook, astronomy in the Southern Hemisphere, Pacific Marine Biology plus topics like Broadway Musicals, Social Networking and How to Avoid Pickpockets. Along with Cunard, Crystal clearly has the best range of lecturers in the cruise industry. 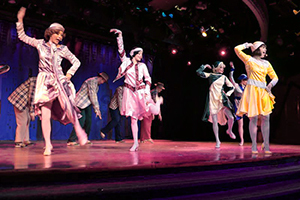 Every evening, the Galaxy Lounge (the main theatre) featured a performance by individual artists (comedian, West End or Broadway singer, concert pianist, electric violinist) or a spectacular production show by the resident band and ten very talented singers and dancers (the Russian Dance Captain was mesmerizing). The shows were always lively, entertaining and colorful but, like on many cruise ships, the sound was often too loud (we noticed several guests putting in earplugs). There were other music and entertainment venues throughout the ship with dancing, DJs and resident musicians entertaining throughout the evening. Cuisine is always important on a cruise and, in our experience, no one does it better than Crystal. On Serenity, 96 chefs (all of whom had at least two years experience in a land-based fine restaurant or hotel) prepared every meal with imagination and flair. The excellent waiters are also land-based veterans with many coming from Eastern Europe and South Africa. We also explored the three optional restaurants (no extra cost) that set Michelin standards for fine dining. 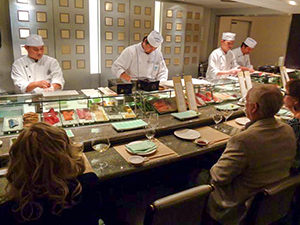 Silk Road and the Sushi Bar (Asian cuisine by Nobu Matsuhisa) and Prego (Italian) make one forget that you’re in the middle of the Pacific Ocean. Prego’s mushroom soup in a bread bowl is an iconic cruise ship masterpiece. Tastes, on the Lido deck, offers small tapas plates that are as tasty as they are beautiful. In all restaurants, a knowledgeable sommelier pours an excellent selection of complimentary fine wines (ultra-premium wines are also available for purchase). Our slow route to Australia included some remarkable ports, most of which were new to us. 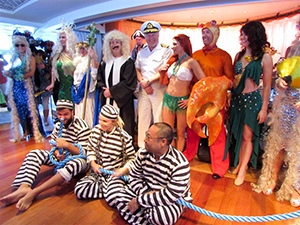 Our two stops in Hawaii (Maui and Honolulu) were followed by another five days at sea and a crossing of the equator (“sorry about the bump,” the captain joked) with a colorful, zany King Neptune ceremony. More than 2,000 miles later we landed in American Samoa, the only inhabited US territory south of the equator. 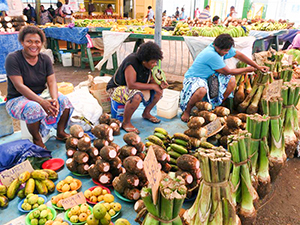 Then it was on to the Republic of Fiji (comprising over 800 islands) where we visited a spice farm, saw a demonstration of ancient cooking practices and were entertained by traditional songs and dances. In Vanuatu, a country we’d frankly never heard of, we stopped at uninhabited Mystery Island for a few hours of sunning and swimming in crystal clear waters. We missed a couple of stops because of stormy weather (we were just staying ahead of Cyclone Gita that devastated Tonga) but enjoyed our last port of Noumea in New Caledonia. It’s a French Overseas Territory governed by a High Commissioner and Congress. It felt a bit like we were in a village of France, especially with the extensive French wine selection in grocery stores. Strangely, the local currency is the Franc, not the Euro. Sailing into Sydney Harbour on a brilliant morning was a treat we’ll always remember. All hands were on deck as we approached the twin symbols of Sydney, the Opera House, and the Harbour Bridge. A perfect ending to a remarkable Pacific crossing – with no jet lag! In the fall, Crystal Serenity goes into dry dock for a refit that includes upgrades to the Palm Court and the restaurants. On Deck 10, several smaller rooms will be turned into suites. Serenity’s sister ship, Crystal Symphony, completed its refit earlier this year and, as expected, is getting rave reviews.